On 5 September, Prime Minister Narendra Modi met Britain's new Prime Minister Theresa May for the first time, in Hangzhou, and held discussions on enhancing bilateral ties in the aftermath of the UK's decision to exit the European Union. The discussion between both leaders held on the sidelines of the G20 summit here on "building opportunities" after the UK voted to leave the EU- the world's single largest market. "Building opportunities with the United Kingdom. PM @narendramodi meets PM @theresa_may for their first bilateral," External Affairs Ministry spokesperson Vikas Swarup tweeted. May was sworn in as Britain's Prime Minister on 13 July, succeeding David Cameron who resigned after the country voted in favour of exiting the EU. May, 59, is UK's second woman Prime Minister after Margaret Thatcher, also known as the Iron Lady, with whom May is often compared. Modi had congratulated May on her assumption of new responsibility on 27 July and had affirmed India's commitment to further strengthen the strategic bilateral partnership. 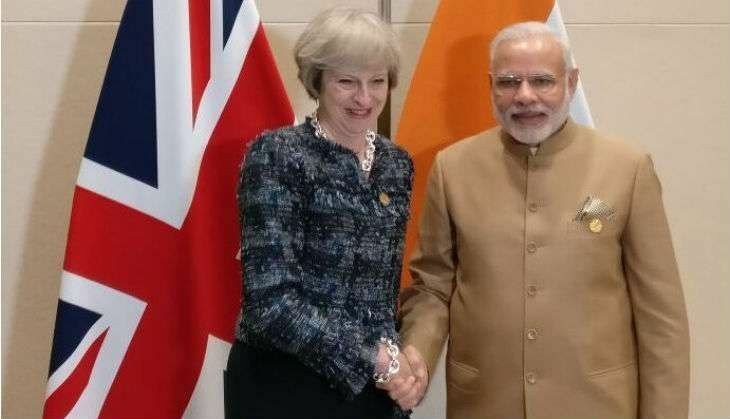 Thanking PM Modi, May had during the telephonic conversation said she looked forward to work closely with India to develop stronger ties and enhance cooperation. PM Modi earlier today said fighting corruption, black money and tax-evasion were central to effective financial governance. He also said, "We need to act to eliminate safe havens for economic offenders, track down and unconditionally extradite money launderers."